The closing round of the 2019 WSK Super Master Series has made another step towards his long-awaited conclusion. As the drivers have completed their respective Qualifying Heats this Saturday in Sarno, we now have a clearer idea of the parties involved in each of the four classes at play heading for the Prefinals, themselves paving the way for the final showdowns taking place on Sunday afternoon on the Circuito Internazionale Napoli. 325,Van-hoepen Laurens(NLD),Ricky flynn motorsport(FA-KART/VORTEX/VEGA), Sarno, 24 March 2019. WSK Super Master Series, © 2019, Alexandros Vernardis / The RaceBox. Three Heats, three victories: Dexter Patterson (KR/IAME) made it crystal clear about his ambitions heading for the ultimate battle in this year’s title quest. The young Brit will consequently start Sunday morning’s Prefinal A from Pole position. Behind him in the provisional ranking, Taylor Barnard (KR/IAME) kept himself on course with two wins, added to his second place on Friday, to take Pole position for the Prefinal B. Gabriel Bortoleto (CRG/TM), third overall this Saturday, couldn’t repeat his winning start of the weekend but still finished twice in the top 3 to join Patterson up front the Prefinal A grid. Luigi Coluccio (BirelART/TM) also did a good job bringing home two top 3-performances to close the front row alongside Barnard in the other Prefinal. Joshua Dufek (KR/IAME) concluded his day in fifth position, three spots ahead of Gabriele Mini’ (Parolin/TM, 8th) and Lorenzo Travisanutto (KR/IAME, 9th), two of the other title contenders against Patterson and Barnard who seemed to have come out of this Saturday with a slight advantage that will need confirmation on Sunday (click here for the full provisional classification). 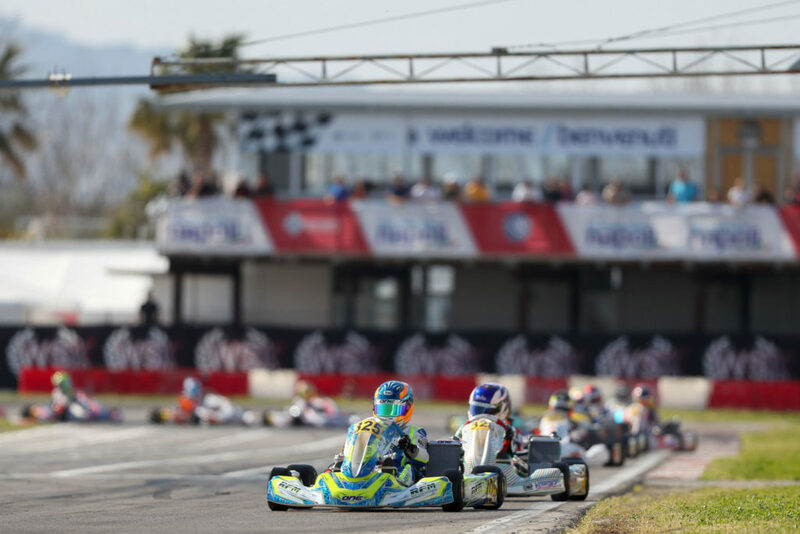 Laurens Van Hoepen (FA Kart/Vortex) turned the circuit of Sarno into his own playground this Saturday. Second-fastest in Qualifying, the new Ricky Flynn Motorsport driver for 2019 concluded all of his four Heats in the top 3 including three wins that put him on Pole position for the Prefinal A. Artem Severiukhin (Tony Kart/Vortex) also showed some good form with three top 3 finishes and a win that grant him Pole position for the Prefinal B. Third in Saturday’s ranking, Thomas Ten Brinke (FA Kart/Vortex) grabbed two victories to join Van Hoepen on the front line of the Prefinal A grid with the points in mind as he currently sits second behind Antonelli in the quest for the title. Tymoteusz Kucharczyk (Parolin/TM) concluded his run with a win and will complete the Prefinal B’s front line alongside Severiukhin. The provisional top 5 of the class is completed by James Wharton (FA Kart/Vortex) who added one win to make it two after Friday but lost ground in his last Heat (10th). Friday’s Polesitter Tuukka Taponen (Kosmic/IAME) couldn’t convert his time performance into race wins and ended up in 8th place ahead of the current points leader Andrea Kimi Antonelli (KR/IAME). The Rosberg Racing Academy protege kept one of his closest opponents for the title three spots behind as Nikita Bedrin (Tony Kart/Vortex) wrapped up his day in 12th place with a win but a DNF in his last race. Fifth-fastest again the stopwatch on Friday, Alex Dunne (Tony Kart/Vortex) faced three difficult results for just one second place that made him fall down the order to 46th place befire Sunday’s Prefinals (click here for the full provisional classification). Rashid Al Dhaheri (Parolin/TM) confirmed this Saturday in Napoli why his two series wins aren’t the result of chance. From 15th in Qualifying, the young driver from the United Arab Estates climbed up the order from Friday to take the top spot in the provisional ranking with two victories and three top 3-finishes. An impressive recovery run rewarded with Pole position for the Prefinal A. Maksim Orlov (Parolin/TM) was the other driver on top of his game today as he claimed four Heats to secure Pole position for the Prefinal B despite a 9th place finish. Joel Bergström (Parolin/TM) edged him in third place (one win) ahead of Coskun Irfan (Parolin/TM), still seeking his first top position this weekend. Arjun Akshay (Parolin/TM) closed up the top 5 with one win for his name. Other winners in the class included Antonio Apicella (Energy/TM, 8th), Maciej Gladysz (Parolin/TM, 10th), Douwe Dedecker (Parolin/TM, 11th), Keanu Al Azhari (Parolin/TM, 13th with three wins that made him recover from a DNF on Friday) and Dmitriy Matveev (Energy/TM, 20th). On Pole position on Friday, William Macintyre (Tony Kart/Vortex)’s bad luck continued today with two distant results adding to an early DNF that made him tumble down the order to 40th position (click here for the full provisional classification). Marco Ardigo’ (Tony Kart/Vortex) confirmed his strong Friday start by adding a win and a second place to his tally for topping the provisional order in the gearbox class. The Italian will start Sunday’s Prefinal A on Pole and precedes his fellow countryman Giacomo Pollini (Formula K/TM), winner of one Heat and Polesitter for the Prefinal B. Lorenzo Camplese (Tony Kart/Vortex) only converted his Pole position in one occasion to start alongside Ardigo’ on the Prefinal A front grid while Francesco Celenta (Praga/IAME, fourth with one win) will accompany Pollini up front the B race grid. Fifth in the provisional ranking was Paolo De Conto (CRG/TM) with two-second places as best personal results. Further down the order, Adrien Renaudin (Sodikart/TM, 21st) made up for his DNF on Friday with a win and a fifth place while his teammate Bas Lammers (Sodikart/TM) managed two top 4 finishes to close up the top ten. With only one round disputed in Lonato, nothing is done yet between the title contenders of the KZ2 category (click here for the full provisional classification). The Round 4 of the WSK Super Master Series finds its conclusion this Sunday with Prefinals and Finals that you can follow here.